Dreamgirl 2 Pce Little Red Riding Hood Costume with red and black satin dress, pleated ruffles, embroidered heart trim, lace-trimmed apron and full length hooded satin cape. 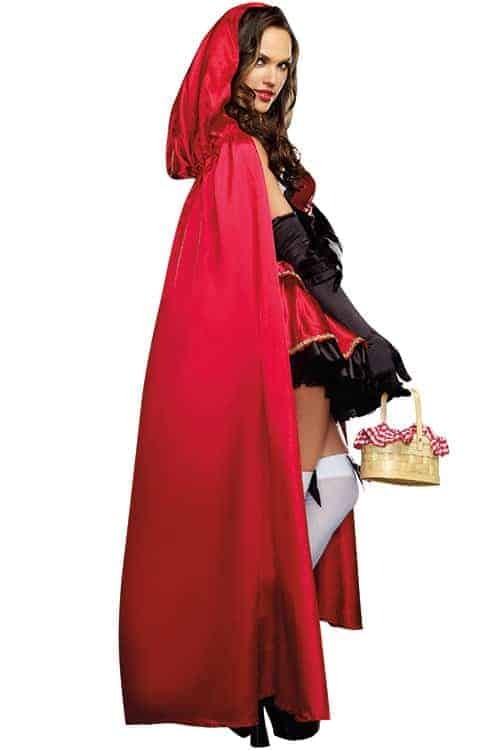 Little Red Stunning Hood will be an enchanted fairytale siren in this Dreamgirl 2 Pce Little Red Riding Hood Costume. It has beautifully detailed red with black satin dress, underwire foam cups, pleated ruffles, embroidered heart trim and lace-trimmed apron. It features self adjusted shoulder straps, zipper back opening for ease of access and the statement full length hooded satin cape to live the part. Designed and made in the USA from high quality manufacturing and materials.